Even as a child, he often suffered toothaches caused by decay, but Mr Mohammed Hatta Aboo Bakar would visit the dentist only when the pain became unbearable. The 62-year-old says: "There were times I could not sleep because of the throbbing pain in my mouth." Over the years, he lost a few teeth to decay. Chewing became a challenge and he also felt self-conscious after a former colleague complained about his bad breath. When the retired security guard moved into the NTUC Health Nursing Home (Jurong West) in December 2015, he was on a diet of soft food and chewed with only one side of his mouth. He recalls: "Eating was a torture because it was painful to even put a spoon in my mouth." 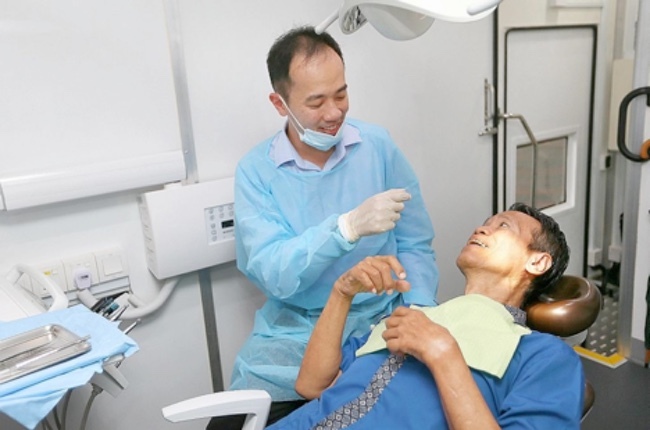 His long-overdue dental check-up took place on board NTUC Health's Unity Denticare Mobile Dental Clinic (MDC). NTUC Health rolled out its first MDC in January 2015 to raise awareness of the impact of oral disease on general health and well-being. It comes equipped with a wheelchair lift for wheelchair users. At the clinic, Mr Mohammed's teeth were scaled and polished. Cavities were filled and topical fluoride applied to his teeth to prevent decay. Now, he visits the clinic every six months for a dental check-up. He also pays attention to oral hygiene - brushing and flossing after meals. As a result, he can enjoy a normal diet of rice with vegetable, fish and meat. "I feel happier now that I don't have toothaches ," he says. "When I was a boy, my parents gave me money to see the dentist, but I spent it on sweets and toys without them knowing. " Dr Goh Siew Hor, 34, assistant director at NTUC Health Unity Denticare, says it is a misconception that losing your teeth is an inevitable part of ageing. With proper oral hygiene and dental care, it is possible to have a good set of teeth. As one ages, there is increased tooth wear and seniors can face increased risk of dental disease, especially those with pre-existing medical conditions or other health issues. For instance, those who have suffered a stroke could have impaired dexterity, which affects their ability to brush or floss properly. Medications can also alter the protective functions and amount of saliva produced, leading to an increased risk of oral disease. Regular check-ups can help identify risk factors for dental disease and manage these risks. Dr Goh said some elderly patients may also have a limited ability to express themselves. The discomfort from oral infections can lead to increased irritability and poor appetite. Some seniors may also feel embarrassed about their bad teeth and choose to avoid socialising with others. "Dental disease is not a problem which will go away if left alone. Rather, it becomes more costly and complex to treat. A small decay may require just a filling but a large decay may require the tooth to be extracted and replaced with either a denture or an implant," says Dr Goh. A Ministry of Health spokesman says adults aged 60 and older who have not attended functional screening in the past 12 months are encouraged to do so. Basic checks on vision, hearing and oral health can pick up age-related declines early so that timely help can be rendered. Follow-up care with the relevant healthcare professionals may be recommended. • For details on functional screening, go to bit.ly/functionalscreening or call the Singapore Silver Line on 1800-650-6060. • This series is an initiative under the Action Plan for Successful Ageing.